Waypoint data (Data in/out) is available from the ACC connector on the rear of the main unit. 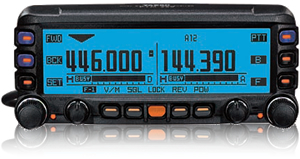 It is possible to acquire your current position (Latitude/Longitude) by connecting an aftermarket GPS receiver to the data port on the back of the radio. Sub-Band APRS® operation may be active in the background, even when operating in the Mono-Band Display mode. Newly added Voice Alert function. Often used keys located in convenient positions for easy operation. Programmable keys on the DTMF Microphone provide direct access to APRS® functions. Yaesu's renowned high quality Die Cast Aluminum Chassis design allows stable continuous high output power operation when you need it most. Incredibly flexible Dual Band Display. You can easily set your own individual preference for Dual Receive and Full-Duplex operation. 5.2"x1.6" (130x40 mm) Large dot matrix (264x64 dots) LCD display for comfortable viewing - night or day. Choose your favorite LCD display color - 8 vibrant Color Options! The Display Control Head is designed for easy separation from the main RF Power Unit - 10 foot control cable included. Optional 20 foot control cable available. High-speed Band Scope included for rapidly checking band activity. The optional Bluetooth Unit (BU-1) provides hands-free radio operation with our Optional Bluetooth headset BH-1A (stereo) or BH-2A (monaural). SmartBeaconing™ from HamHUD Nichetronix is able to modify its own beacon rate in response to the motion of the vehicle. Since the APRS network has limited bandwidth, SmartBeaconing™ transmits an optimal amount of position information with a minimal amount of QRM to other network users - making FTM-350R users some of the most "efficient" on the network. For emergency work, or to extend the range of a hand-held unit, the FTM-350R includes Cross-Band Repeat capability. Huge Memory Channel Management Capability! Able to display your friends APRS® stations (FTM-350R and VX-8R / DR) directions, distances and other information in relation to your location. Built-in stereo decoder for FM Broadcast: Listen to FM Broadcast in Stereo with dual speakers on the rear of the control head! Optional FPR-1 Monitor Unit receives your transmission out to about 1,000 ft (300 m) depending on transmit power and other conditions. Give to others to hear your transmissions during emergencies, special events, and so many other operations so that they can follow the situation. The front panel Built-in Microphone activates PTT transmission. A MH-48A6JA / conventional hand microphone with DTMF is also included with the radio. "Line In" input permits playing your favorite stereo music from other devices. Built-in Barometric Pressure Sensor - The radio can monitor and display your altitude and pressure.